The bookies did not take long to react. Rory McIlroy's withdrawal eight holes into a miserable second round at PGA National rendered him a 3-1 shot to miss the halfway cut at next month's Masters. This is despite his remaining 6-1 joint favourite with Tiger Woods to win the first major of the year. I can only say that i hope McIlroy will recover to where acting like a pro can stand out. Sort of shifting to Michelle Wia, we took an interest in her only being 1g years of age that did not giggle or talks like a teener. Also to be amazed she was standing 6 feet tall at 16 yrs of age & still growing. I thank my parents that were normal gofers & my Mother even more so in seeing a good golfer be it a male or woman. She was going to be payed to be a spectator at the Banff Golf course, but like a smart woman she tu rned it down knowing it would be to cold in some places yet let down a fellow woman golfer that did suffer to be able to watch the amazing prows. That woman shen still pregnant would ask my late Mother to come out to play with her on the same Banff golf course. Yes she had a lovely baby boy. Golf courses challenge players with sand traps and water hazards. But for one golfer, he can now add sinkholes to that list. Mark Mihal, a 43-year-old mortgage broker from Creve Couer, Mo., suffered a dislocated shoulder after a sinkhole opened up beneath him while playing a course in Illinois. 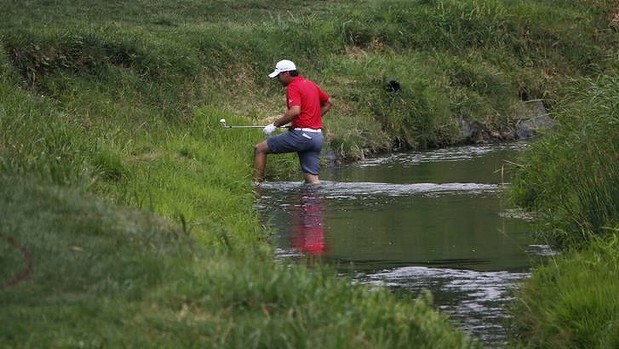 We hear about sinkholes swallowing roads and now houses, but a golfer? That has got to be a first in the Golf World. He's lucky to come away with just a dislocated shoulder. Once again there is controversy at Augusta. Because Tiger is a big name he was not disqualified for an improper drop, but was given a two stroke penalty. An unknown teenager that has worked hard to stay in the tournament, but was penalized for playing too slow. If it had been the other way around that teen would be sent home because he is an unknown. TV ratings is big business and having Tiger around attracts the fans. The rules were changed 2 years ago, but that doesn't make them right. Tiger Woods escaped disqualification from the 77th Masters Saturday morning, but was assessed a two-stroke penalty for taking an improper drop during Friday’s second round. The ruling, issued by CBS, er, by Augusta National’s rules committee Saturday morning, allows a golfer to be penalized two strokes, rather than be disqualified, for signing an incorrect scorecard that did not include the penalty for the bad drop. Well, a lot of people said it was Tiger Woods's Masters to lose. Few could have imagined the lengths to which he'd go, to do it -- or the lengths to which the Masters rules committee would go, to ensure that he didn't. At least, not before two days of guaranteed boffo weekend TV ratings. A day after infuriating much of golfdom by singling out a 14-year-old Chinese boy, Tianlang Guan, to pay for the slow-playing sins of all of professional golf, the green-jacketed rulers of the Augusta National Golf Club were forced to deal with a much bigger fish. Phil Mickelson sat in the media center early in the week and told anyone who would listen that he was in love with links golf. He had just won the Scottish Open a couple days prior and described his emotions for this type of golf as “hate-love” meaning he used to hate it, but now loves it. To boot, Lefty insisted that, “from an opportunity-to-win standpoint I would say that Muirfield or Troon would offer the two best chances." A month after a U.S. Open loss, one Mickelson called heartbreaking, he produced one of the best final rounds in major championship history by shooting 5-under 66 to win the 142nd Open Championship at Muirfield. It's his fifth career major win. 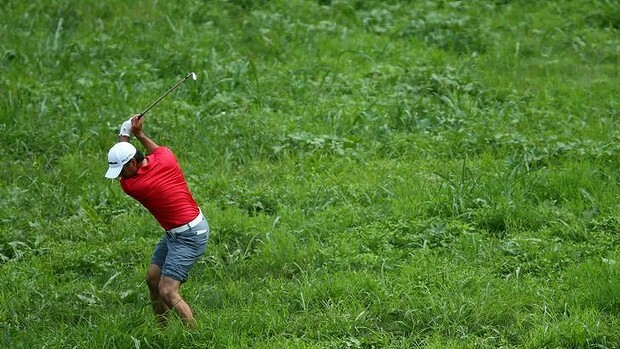 Poor Rory, no where to be seen and Tiger's comeback isn't going as planned. He won't be a happy camper tonight. Kentucky-state of that fine Derby and the baeball bat. 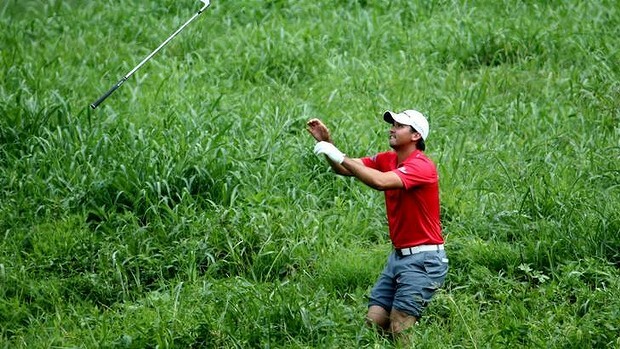 Give this golfer credit for saving his shot. If his watery trip drew blood (aka bug bites), the golfer would have first aid patch him. Quite the brave athlete. The 2015 Masters gets started very soon and I will post a link to the BBC pages that will cover this year's Masters Tournament. That link also provides live coverage, if you are inclined to follow the action shot for shot. It might also be a good idea to post here the list of the present top 20 players in this game of knocking a little ball around on great big, very long and narrow green fields. Well, I think most of us think of green and not white, like in snow conditions I have heard of in some places where there is no green. Jhonattan Vegas won the RBC Canadian Open and is buoyed by the win to take on the world in golf in next month's Summer Games in Rio. And besides his family, Vegas said this victory was for Venezuela. He’ll be representing his country at the Olympics in Rio next month, and the win comes at a good time for his homeland.